CEBU Country Club (CCC) completed a date with PAL Interclub history on March 9 at its own turf after claiming the overall title. CCC also ended the four-year reign of powerhouse Manila Southwoods and became just the second team in PAL Interclub history to win the overall title while campaigning in the Founders Division. CCC finished the four-day tournament with a balanced scoring to complete the title run with 516 (124-121-131-140), beating the Manila Southwoods by nine points. Aside from CCC, two other Cebu-based clubs won in the Aviator and Sportswriter Divisions. PAL Interclub veteran Bayani Garcia and young gun Julius Pierre “Pio” Neri fired even-par- 72s worth 36 points each to lead the club’s final assault, while former pro Mark Anthony Dy added 35 and team captain Marko Sarmiento chipped in 33 points. “We are speechless right now. This was never part of our plan. Our focus was just on the Founders Division. When we were leading, we never thought about it. It only sank in after the third round,” Sarmiento told SunStar Cebu in an interview. CCC duplicated the 1988 triumph by an Aguinaldo team made up of future international luminaries like Ramon Brobio and swing coach Bong Lopez. Coincidentaly, Thirdy Escaño, the non-playing captain of Southwoods, was part of that team. Garcia, who fired a pair of 36s in two rounds—one in CCC and Mactan Island Golf Club—said the mentality of the team coming out on the final day was to have fun after taking the lead in Round 2. CCC completely turned its fate around after failing to make it in the top three in the past two years. “After the second day, we got them by 14, but we were not complacent because they might do it to us in the next round. We got them in the third and had the lead going to the final round. So we went out there and made sure to have fun,” he said. CCC was so good in the final round that the 32 points of Harvey Sytiongsa did not count. “Bayani (Garcia) and Pio (Neri) got their Southwoods opponents in the final round and that was a difference maker. We never had a team in our PAL Interclub stint (that played so well) that 32 points did not count,” said Sarmiento. It all paid off for CCC after starting its preparation early for this year’s PAL Interclub with the goal to redeem its performance in the previous two editions. “The hard work started from November until now. The guys put in the time and put the effort for this to be possible,” said Garcia. “I don’t think it can get better. This is the best it can ever be,” said Sarmiento. The triumph was an icing on the cake for the Cebu-based club after its former junior golfer Lois Kaye Go won a gold medal in the women’s team event of the Asian Games and Lloyd Jefferson Go made his presence felt in the PGA Tour China. “I think it’s a testament of the support that we got from the club. LJ Go and LK Go winning in their respective events, it culminated with our performance. It’s a perfect way to sum up how the club played in the past months,” he said. Southwoods got 38 points from Yuto Katsuragawa but couldn’t get the others to deliver the numbers that Escaño expected, settling for second and blowing their own bid to win the tournament a fifth straight time, a record solely held by Canlubang. The Cebu CC victory also gift-wrapped the Founders Division title to Orchard Golf Club with the Dasmariñas-based squad tallying 482 after a fourth round 129 for a 24-point win over Forest Hills. 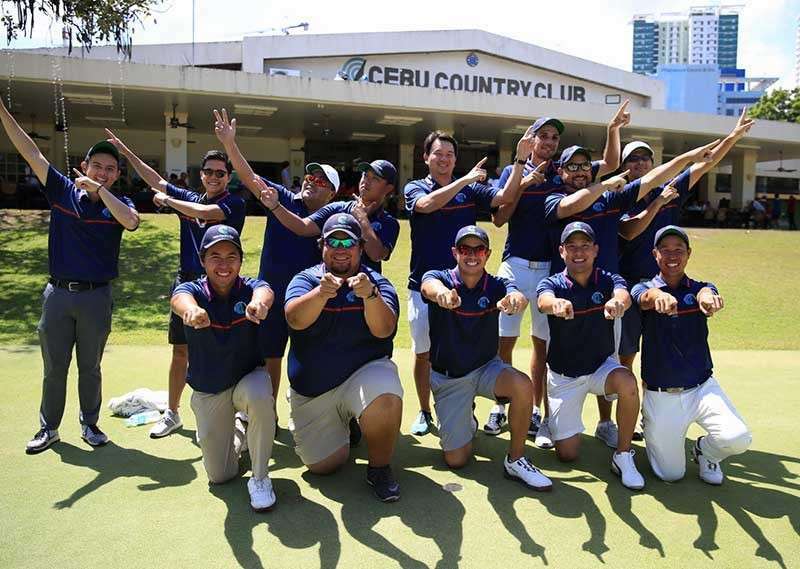 On the other hand, Club Filipino de Cebu won the Aviator Division after posting 409 points, beating Alta Vista Golf and Country Club’s 393. Baltaire Balanguan scored 35 points, Jerome FLores had 31, while Tedoro Almario and Raymond Garcia had 22 each. The Mactan Island Golf Course also won the Sportswriter Division by three after scoring 84 yesterday to finish with 342. Pio Barandog Jr. led the team with 28, while Elvis Jequinto had 22. Gerardo Catindoy scored 19 and Nicolas Parilla scored 15.